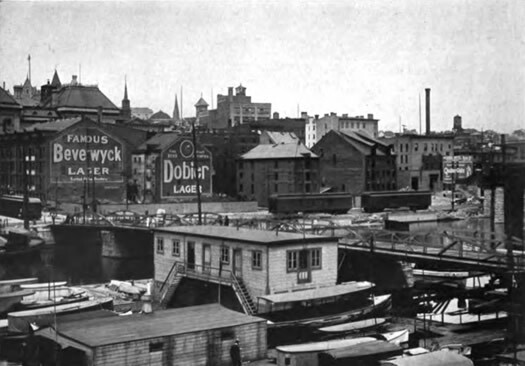 The State Street Pier on Albany's riverfront in 1914. The Albany river front -- how to better connect it with downtown, how to add amenities, what to do with 787 -- has been a frequent topic of conversation for years. How many years? At least a hundred. The Albany water front had long been given up to commerce. Railways, steamships, factories and warehouses had seized it and ruined it. Their activities were carried on in a slipshod manner without order or system, as may be seen in the accompanying photographs. The devastating ugliness of the old water front can no longer be endured. The demands for commercial efficiency combined with a growing pride in the appearance of the city have dictated a new order of things. The rights of the community are now being recognized as not subservient to the claims, or whims, of the individual, and the individual or corporation now appreciates that order, regularity and even a certain amount of beauty are of absolute advantage to success in business. The new water front will possess "order and completeness" and the beauty that arises therefrom, the beauty that is the result of successfully designing a thing to suit its purpose. Quay Street will be broad. The various buildings for the freight and passenger service of the Steamboat Companies will be orderly and well designed. The railroad tracks will be elevated and the railroad yards concealed from view. Pedestrians and the vehicular traffic are to be provided for by new roads and sidewalks. Grade crossings will be abolished. 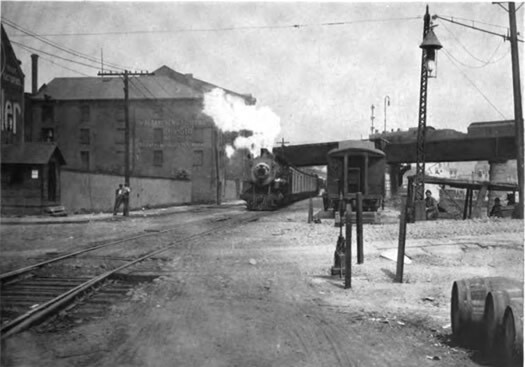 The railroad tracks along the Albany riverfront in 1914. As Mr. Andrews has explained the city will actually own its own water front and further will reclaim a part of the Hudson River which will be dredged so that the harbor will contain deeper water than at the present time and all of it will be navigable for large boats. An intercepting sewer and disposal plant are being constructed so that the water of the Hudson will be kept clean, and in doing this Albany is setting an excellent example to other river towns. Broadway connects the new Plaza directly with Quay Street. It is to be made 100 feet wide, the roadway 60 feet and the sidewalks 20 feet, and where it reaches the water front it is to be spanned by a bridge which will carry the railroad tracks overhead. This bridge should be designed with the greatest care as the juncture of Broadway and the water front is a most conspicuous position and the whole effect of the improvements may be ruined by an unsightly bridge. The spans are probably too great and the headroom not sufficient for masonry arches, but a bridge can be designed that will be attractive and at the same time perfectly fulfill its practical uses. There. are many examples of bridges and viaducts by which we may be guided in this case and the city should demand the best design obtainable for this important structure. The concrete walls can be made interesting by rusticated piers and simple panels and appropriate mouldings. In other words they must be designed and not left to chance. A wall of this sort can be made quite decorative but not necessarily expensive by the exercise of skill and thought in its design. The freight trains and yard in connection with the Hudson Navigation Co. are to be screened from view by a covered passage that will provide a platform for shipping and at the same time present a pleasing appearance from Broadway. This is to be built in the same manner as all the buildings for the Steamship Lines on Quay Street, which are to conform as much a possible to the architecture of the small structures on the State Street Pier. Brunner's rendering of a proposed waterfront building for the Hudson Navigation Co. The same materials and the same red tile roofs are to be used, so that while a symmetrical arrangement is unnecessary, and in fact impossible on account of the line of the water front and the varied uses to which these buildings are to be put, there will be a general uniformity of effect. The present condition of the water front from Madison Avenue to the Rensselaer Bridge is shown on Plate 26, and it cannot be doubted that radical improvement is necessary. Plate 67 indicates the treatment suggested and the amount of property that the city should acquire in addition to the present parte. The large area for the waterside park is arranged so that it provides fine, shaded walks parallel to the river and an adequate playground for children, which may contain a wading pool, swings, sand piles, etc., and a shelter or pavilion. This park will prove to be a most unusual feature as it has advantages that can seldom be found. It has a splendid frontage on the river and it is shielded from the railroads by a concrete or masonry wall on the land side so that it can be made an agreeable recreation ground, not only for children but for adults. A small portion of ground is indicated for a park on the south side of Rensselaer Bridge so that the approach to the city will be among trees and grass and not shut in between factories and warehouses. It seemed at first as if the excellent treatment of the water front of Budapest might serve as an example to be followed in Albany. The river traffic on the Danube is taken care of by broad stone platforms and docks which are lined with warehouses, the roofs of which form the roadbed for the trolley cars, and back of this there is a beautiful avenue lined with trees and bordered by attractive buildings. The conditions that exist in Albany made a similar treatment impossible but most of the desirable elements of the Budapest river front have been borne in mind and an attempt has been made to reconcile the requirements of commerce, traffic and beauty. A century later we're still talking about potential transformations of this type, as something Budapest-like floats out in the future. A short passage about Tivoli Park: "Tivoli Lake Park possesses great possibilities. It is disappointing in its presence state as it is sadly in need of planting and the roads turn too sharply for automobile traffic, but with some study and rearrangement it can be made very attractive." Some of that sounds familiar.